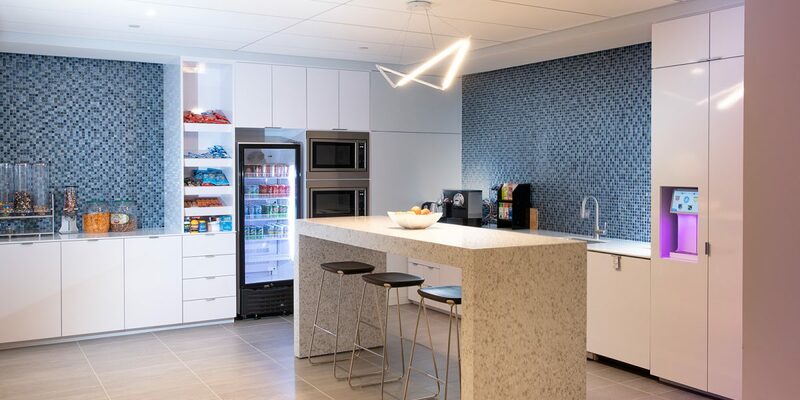 Tishman Speyer repositioned this building in 2015 and did a full replacement of the original mechanical system with an all-new dedicated outdoor air system (DOAS). The façade was upgraded to an all-glass curtain wall with energy efficient glazing and energy meters were installed on each floor to meter tenant energy usage. The 4th floor tenant space that Robbins Russell claimed in 2018 sat vacant after the 2015 building upgrade. GHT provided MEP design services, allowing Robbins Russell to be one of the first tenants to fit out their space with the new DOAS. This caused the design process to required the base building MEP engineer (WSP) to review and comment on the design to be sure it fulfilled the tenant design intent and incorporated the appropriate design details and sequences of operation. GHT then conducted a site walkthrough with the building engineer and contractor prior to ceiling close-in to be sure the on-site engineers understood the mechanical design and had adequate access to DOAS terminal units, associated valves and filters. The suite features an 800 SF multipurpose room, mix of open and enclosed offices, café area, IT/Server room with dedicated exhaust, Mother’s Room and unisex restroom. 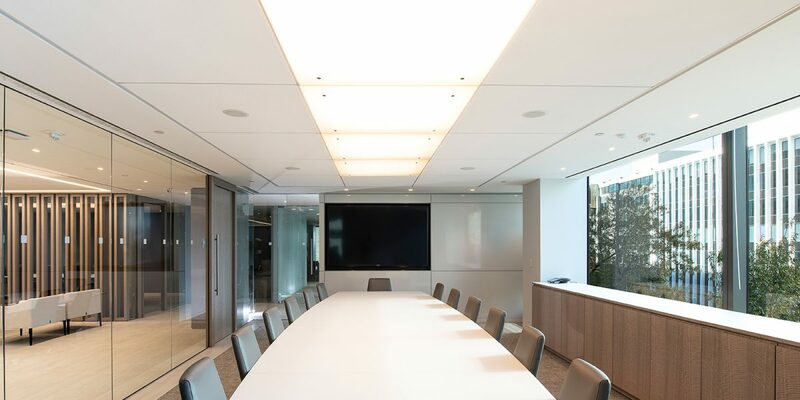 The space utilizes Lutron Vive dimming packages for control of its LED fixtures in feature spaces like the multipurpose room, conference rooms and reception area. Photo sensors for daylight harvesting dim down lights to preset light levels in perimeter areas when there is sufficient daylight detected. Typical offices have controllable receptacles for plug-load control of convenience outlets to meet Green Code requirements. A ceiling mounted occupancy sensor and relay module integrate receptacle control with lighting control.